Initial remark – this is not a scientific text – that would require a lot more space. It is well known that no one in Poland has described sails in terms of aerodynamics in such detail as Czesław Marchaj in his book “Sailing Theory – Aerodynamics of Sails.” If you are not familiar with this publication and feel the need to gain more knowledge, I highly recommend this read. It is a book written by an enthusiast for enthusiasts. My goal is to raise some issues that may be useful for users of sails that do not have a lot of sailing experience, or the time to expand it. A few words about the materials. 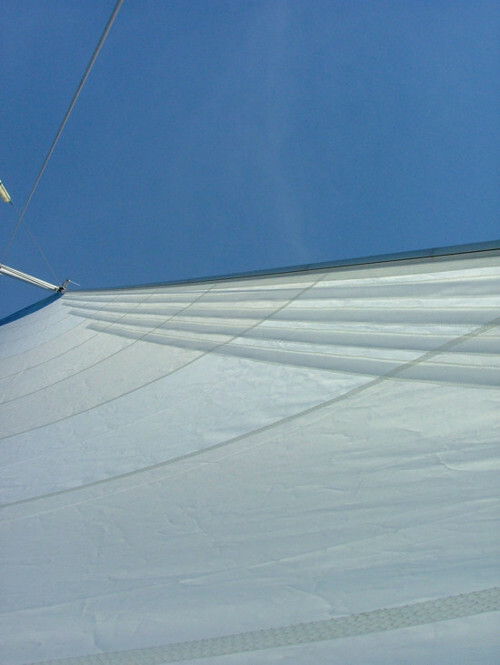 The basic material from which sails are made is synthetic fibre i.e. polyester (other names include Dacron, Tergal, Terylene). Polyester can be weaved in various ways and thus different fabrics can be obtained – from recreational standard to racing standard Dacron. Basic Dacron (recreational standard) is present in our everyday life. When we pick up a sail from the sailmaker’s shop, it seems to us that it is as stiff as parchment. After a year of use, we see that it became soft, it stopped making noise when folding and flapping in the wind. It is a normal phenomenon. The factory finish of the fabric was “crumbled” through its use and the sail became more “friendly” to the user. This does not mean, however, that it needs extra help, like rolling it into a bundle and jumping on it. This way, we will soon visit a sailmaker’s shop again to purchase its successor. With the right attitude, a sail’s lifespan can reach 10 to 20 years (it’s not an exaggeration), with a little help from the sailmaker. But let’s get back to our topic. Dacron for recreational sailing should only be used for the horizontal cuts. To make a radial cut sail, we must have Dacron, which is woven directionally, i.e. transfers heavier loads along the warp (the edge of the material). Among the special types of Dacron, we can also mention Dacron that allows for rolling the sail on the stay without much harm both to its profile, and lifespan (most common: DC and Profile from the German company Dimension Polyant). We will return to these types of sails a bit further. It is a basic set, which should be featured on every boat to ensure our safety on a sailboat. Having a too big staysail in case of too strong wind, we will dedicate too much attention to controlling the sail, instead of our course. Too small of a sail is theoretically safer but, in turn, in some cases, it gives too little thrust. 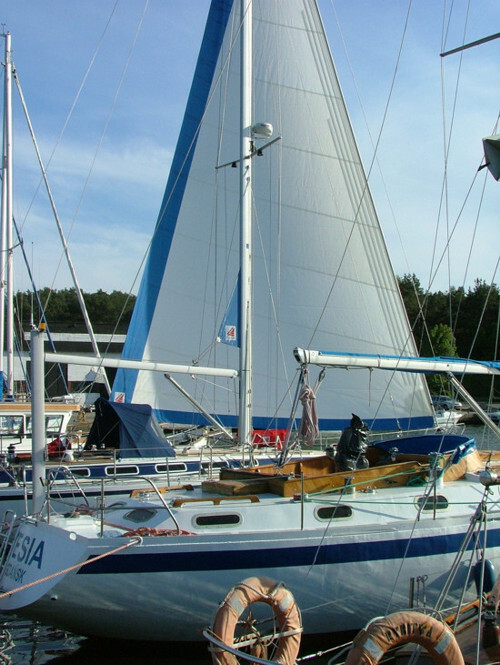 When it comes to the genoa and the working jib, they will be discussed in general terms in the discussion on furling jibs. Instead, I would like to focus on the storm jib. It is the most “neglected” sail. It is well known, that on smaller bodies of water, in case of bad weather you quickly sail to the shore or not sail out at all. It seems, therefore, that in our set of sails, the storm jib is unnecessary. Nothing could be more wrong! And what in the case of larger bodies of water? And what if the change in the weather comes suddenly, the motor will not start or there is no motor? If we do not have storm sails we are at the mercy of the elements. With the ability to reef a large area of the mainsail, and not just one or two square metres, and with the use of a storm jib, we have control over the boat. When one of these sails gets torn, we can still partially control it. There is nothing worse on a sailboat than helplessness because of own negligence in regard to the element of water or air. A common practice is to sail out using a vessel, with “anything” hung above its deck: a mainsail with pockets without battens, a foresail with half the sail slides, etc. A storm jib should be a sail, which will provide us the ability to manoeuvre the boat in case of a really strong wind. There are conditions when the smallest sail must be taken down. The rigging area itself and the side area of the hull have such an aerodynamic resistance that the boat barely stays on the water, in a position in danger of tipping over. It is well known that a larger sail may be deprived of power, by loosening it so that it flaps. The only problem is that a large sail causes a large flap and large vibrations, and hence the possibility of destruction of the sail. But that’s not all. Vibrations are transferred to the rigging, also affecting its destruction. Loose shrouds, stay, lanyards, broken pins is a result of the impact of excessive flapping of the sail. The result: the faulty rigging flies into the water, the “healthy” rigging will be weakened. The need for a storm jib becomes clear. Its small size (20-25% of the area of the triangle defined by the mast, stay and deck) will allow us to use the strong wind to our advantage and “ignore” too strong gusts of wind without adverse effect on our sailboat. Now a few words about furled staysails. The simplest furlers on a wire rope allow us to quickly roll the sail for the purpose of parking, without major problems. Better furlers with an aluminium profile on the stay allow for a wider range of use of a staysail, which help to increase the safety of navigation, as I mentioned earlier. Referring to the materials: a furled sail made of recreational standard Dacron after some time “remembers” the rolling and tends to curl in light winds. Reefed on a rigid stay, it is consumed faster than a sail made of Dacron adapted for a radial cut and for rolling. The greatest loads on the staysail are formed on the clew. From it, they radiate out to the rest of the sail, with a greater density in the direction of the leeches and the foot, and smaller towards the centre of the sail. The system of seams arranged along these loads causes that they are much less susceptible to breakage in comparison to the traditional horizontal layout. All of this allows us to use a lighter fabric for radial sails. A lighter sail when flapping transfers weaker vibrations to the rigging, also obtains a smaller force of inertia, which increases in the direction of the leech and destroys it. Each sail has a certain profile. By rolling it on the stay, we roll it from the edge of the luff inwards. If our goal is to reef the staysail, in order to obtain a better profile of the part that is not reefed, we can use the help of so-called compensating foam, sewn on the luff of the sail. Rolling the sail on a rigid stay increases its volume at the height of the biggest bulging of the sail, and flattens its profile in the deepest places, collecting more material there. It is not a necessary element for staysails, but it is helpful. Rolling the staysail does not always collapse it correctly. 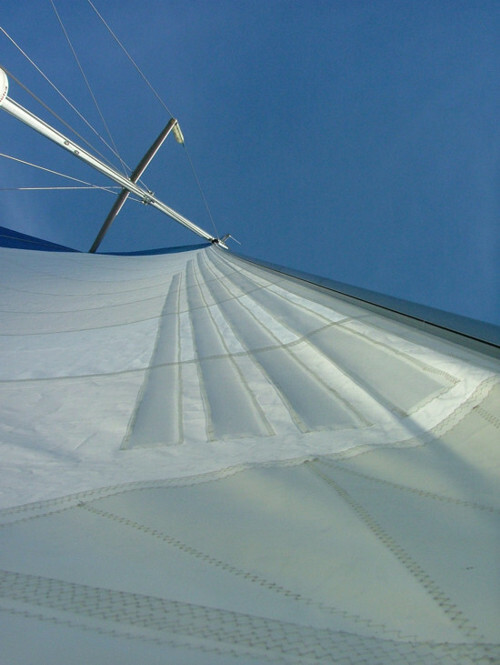 Sometimes creases are formed on the rolled part of the sail – a layer of compensating foam will somewhat reduce the creases. In this case, it is also not necessary, yet it is helpful. Contrary to popular belief, the most destructive factor to a sail is not water, but the sun. Currently, when a lot of boats are chartered, when we sail fast, because there is no time, because tomorrow or the day after tomorrow we go back to work, then the sails are simply rolled on the stay. We put them on the boom and leave them, because maybe we will sail again in an hour or tomorrow. Under conditions where there is no wind, and the sun is scorching, the radiation destroys polyester much faster, causing its structure to weaken. Sailors sailing on the Mediterranean Sea know that without paying attention to shielding sails from the sun when parked, they will quickly become customers of a sailmaker’s shop, either or to repair the sails, or to sew a new set. In order to protect the rolled sail, you can use Dacron factory protected against UV radiation. You can also sew fabric on the leech and the foot of the staysail to protect against radiation. Often one sees sailboats parked by a berth, with the staysail rolled up, which seems to be blue or red. This is the UV fabric sewn on the sail’s edges. Another solution may be putting on a cover on the rolled up staysail. It is really worth it to take care of such seemingly unnecessary details in order to avoid unforeseen events. A sail which is not shielded from the sun when the boat is parked, after some time will simply tear when sailing (in the parts exposed to the sun when parked). And it was not because of poor seamanship but due to negligence. A common mistake that significantly affects the working jib is too small stay tension. If the tension is correct, the effectiveness of the work of the staysail is greater than of a mainsail of similar size. The only factor disrupting the flow of air around the foresail is the stay (in case of the mainsail – the mast). The difference in diameters is obvious and the effectiveness, therefore, as well. The stay bends under the work of the working jib, causing the widening of the front part of the sail. If the sailmaker does not take this into account, too much depth of the foresail will reduce the effectiveness of sailing upwind (too much force on the foresail favourable for running free, a deterioration of cooperation with the mainsail, reducing its effectiveness in sailing upwind, and eventually flapping of the foresail leech). If the bend of the forestay is too large, the best staysail will not be able to overcome this with exactly the same results (see above). And the last element – staysail trim angle. In the majority of sailboats sailing on our inland waters, the place for installing the mainsheet track is marked by the boat manufacturer. It is averaged for practical reasons – a foresail is the most commonly used sail by our sailors – according to the principle: universality at a low cost. At a time when we want to use different sails with different sizes, for different purposes, or even to use a single furling sail on a rigid stay in a better way, the simplest operation allowing us to increase or decrease the trim angle is to use a kicking strap. A kicking strap is a pulley with a rope, attached to the foresail rope (prior to its entry into the lashing block on the sail track), making it possible to tighten the sail rope to the axis of the boat or to its side, allowing us to change the angle of the trim and better use of the given staysail in certain conditions. On larger sailboats, two long sail tracks running to the staysails are used. 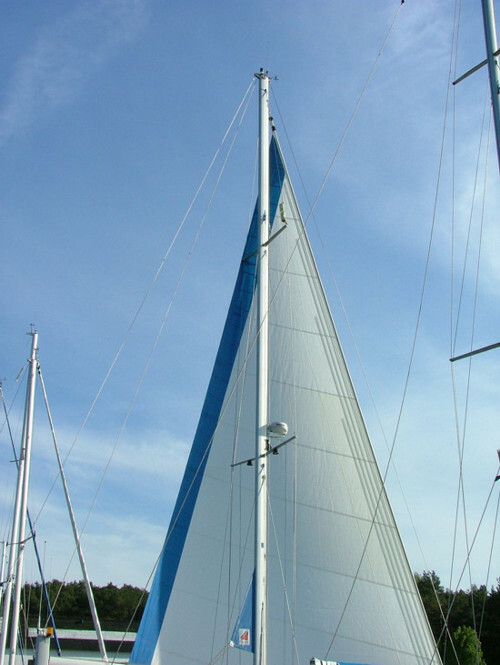 For longer cruises, much more important is to fit the correct size sail with its correct trim angle trim, as opposed to smaller boats during short trips on inland waters. Now a word about wire ropes. With a basic furling forestay (when the forestay luff assumes the role of the stay), it is necessary to place a wire rope in the luff. In the case of pinning the foresail to the stay using slides, the wire rope is completely unnecessary. It is a custom from years ago, where the wire rope was used for large sails in seagoing vessels. In this way, it secured the luff of the sail against excessive load when putting up the sail. It should be added that the staysail luff was tensioned using a capstan “to the max”. Certainty that you can turn the capstan until the first crack caused that it was turned to the second and the third crack as well. The wire rope was a kind of protection against overloading. However, later it was an interference when folding the staysails, and improper seizing deformed the tack and the head, chafing the edge of the sail. All our repairs of such sails came down to damage to the luff. In this case, we have proposed using a soft rope – strong polyester or Spectra. Adding some slides to reduce the distance between them, while not causing the formation of folds between them on the luff (with a medium heaving of the halyard), was fully sufficient. An old sail was becoming “friendly” to the user, it did not sting with the wire rope when folding, it was easier was to control the tension of the luff. The fact is that it required a little smarter approach than before, but is that too much to ask for? All this is related to large staysails on large seagoing sailboats. As for the small inland sailboats, the wire rope with the simultaneous use of slides is completely unnecessary. Often a polypropylene rope is then sewn into the luff (an ordinary polypropylene rope). Slides placed suitably densely provide 100% effectiveness of such a system. This is not an untested solution used since last year. We have been using it for 10 years, always with positive results. The purpose of this article is to provide readers with practical knowledge about staysails. Knowledge which we share every day with our customers. 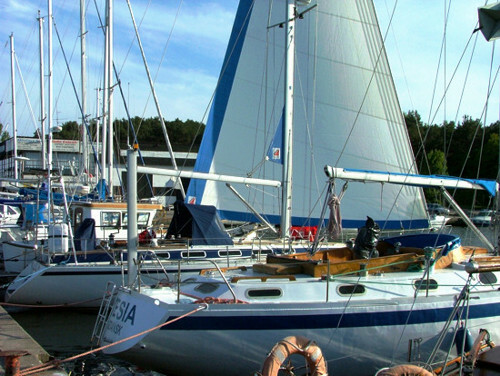 Some of them come to us with specified requirements for sails, and only consult certain details with us. Others rely in 100% on our experience and knowledge, only expecting good sails that will serve them for a long time. We try, whenever possible, to meet the needs of both. It is no trick is to sell one set of cheap sails, with a small area, sewn using too thin material and with cheap finishing elements. The trick is to sew good sails, with a long lifespan, wide range of use and ease of use. Very often it is better to pay more, but really not that much more, to get a good product. The price of a sail cannot be a factor in choosing the version of the sail. You have to pay attention to what the given sailmaker’s shop offers for the price. Our advice: before sewing the sails, consult your sailing friends, compare the craftsmanship, finishing details, price, functionality, efficiency of the sails. Only then can you decide on your choice of a sailmaker.